Nuisance algae are perhaps the number one challenge facing aquarists and various strategies exist to prevent their growths. Pretreatment of makeup water (including reverse osmosis filtration, deionization), additions of high pH solutions of water and calcium hydroxide (kalkwasser), protein skimming, algal scrubbing with macro-algae, use of fish foods with low phosphorus content, etc. all can help control nutrients responsible for algal outbreaks. These methods have one thing in common – they target the element phosphorus. Phosphorus is an element essential for all life forms including plants and algae. Indeed, bags of lawn fertilizer are marked with numbers (such as 10-5-5) indicating the amount of nitrogen, phosphorus, and potassium (‘macro-nutrients’), respectively. If we were to remove or limit one of these macro-nutrients, we would be able to control the growth of plants and algae. This concept is known as Liebig’s Law of the Minimum, which states plant growth is not encouraged by the total amount of nutrients available but instead by the one least available. Hence, phosphorus is often the element targeted for removal. Biological removal is possible, but requires a certain sequence of biochemical events. More often, phosphorus is removed by chemical means and is often done on industrial levels in wastewater treatment plants. It can be done in aquaria as well. Recommended phosphate levels for reef aquaria vary somewhat although most are generally low (~0.03 ppm, or mg/l – 3 parts in 100,000,000 parts – quite low indeed). Silica (SiO2) is of concern to hobbyists because it is used by diatoms to create their skeletons. Outbreaks of diatoms are characterized by brown coatings or filaments. While diatoms in themselves are not harmful (useless they smother sessile invertebrates) they can be unsightly. Some artificial saltwater manufacturers will not include silica in their mix. However, drinking water can often contain significant amounts of silica (~14mg/l). Since diatoms are photosynthetic, limiting phosphorus along with silica can control their population within aquaria. Silica can also ‘plate out’ on hot surfaces (such as heaters or pumps allowed to run dry) and can be difficult to remove. A non-metal element considered essential for all life forms. It has an atomic weight of 30.9738 g/mol; its symbol is P.
Phosphorus bound with oxygen, and almost always the form of phosphorus found in aquatic environments. This form is readily ‘bio-available’ for plant and algal growths and is the type measured by hobbyist test kits. It may be suspended or dissolved in the water column. Often reported as PO4-3, the recommended amount in a successful reef aquarium’s water should be low (less than 0.05 ppm, or mg/l, if you prefer). When we consider that the phosphorus (P) portion of phosphate (PO4-3) is only about 1/3 of its weight, we can easily see that the ‘reactive’ part is only about 0.017 ppm. However, hobbyist test kits report ortho-phosphate as PO4-3; hence the recommended value is 0.05 ppm or less. To convert PO4-3 to P, divide by 3.066. To convert P to PO4-3, multiply by 3.066.
the sum of ortho-phosphate (easily measured) and that phosphate converted to ortho-phosphate by a severe digestion process employing potassium persulfate and sulfuric acid. Total phosphate can be suspended, dissolved, or incorporated in animal and plant tissues and is usually less bio-available for encouraging algal growths. Two Little Fishies, Inc. (or TLF, Miami Gardens, Florida USA) has been providing products to the pet industry since 1991. They offer a variety of products ranging from fish and invertebrate foods to aquarium supplements. Two of their offerings were selected for this month’s Product Review – the PhosBan Reactor (model 150) and PhosBan phosphate/silica adsorbent. For use on freshwater or marine aquaria, up to 150 gallon (568 liter) capacity. Flow rate through reactor should be 20 – 30 gallons (76 – 114 liters) per hour – this will require a pump capacity of 100 – 200 gallons (379 – 757 liters) per hour. A Maxi-Jet 500 (a misprint in the directions – a Maxi-Jet 400 or similar pump will work just fine) is recommended, but throttling will be required using the supplied ball valve. Excessive flow rates may cause the media to crumble – the directions use the synonym ‘friable’). Reactor capacity depends upon the media. The 150 reactor can hold up to a maximum 200 grams of PhosBan media (5 inches or 12.7cm height within the column, with a recommended minimum of 2 inches or 5cm). The column can be filled to capacity when using granular activated carbon. 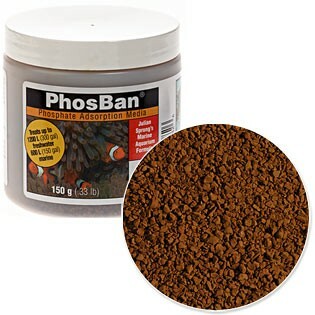 If an amount of PhosBan required is below the minimum depth within the reactor, TLF recommends mixing PhosBan with activated carbon. Iron particles possess a natural positive charge (these ions can have a valence of 2 or 3) while phosphorus possesses a negative charge. Since opposites attract, the phosphorus can be bound to iron (in this case, the ferric state, or Fe +3) thus removing it from solution and preventing it from fueling algal growths. It is uncommon (and difficult) for hobbyists to distinguish between ‘bio-available’ phosphate (called ‘reactive’ or ‘ortho-phosphate’) and total phosphate (organically-bound) since the latter requires specific laboratory testing procedures and equipment. I wondered what impact PhosBan would have on organic phosphate concentrations and decided to test for it (see the ‘Methods and Materials’ section below for details). 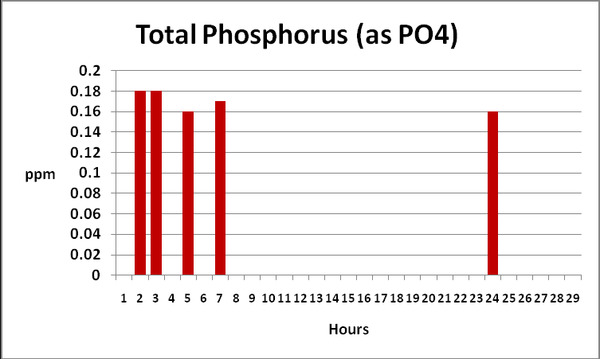 Figure 1 shows the results of testing for Total and Reactive (‘ortho-‘) Phosphate over a period of 12 hours. Figure 2 demonstrates that, when ortho-phosphate content is subtracted from the amount of total phosphate, the level remains relatively stable, indicating removal of reactive ortho-phosphate only. Figure 1. 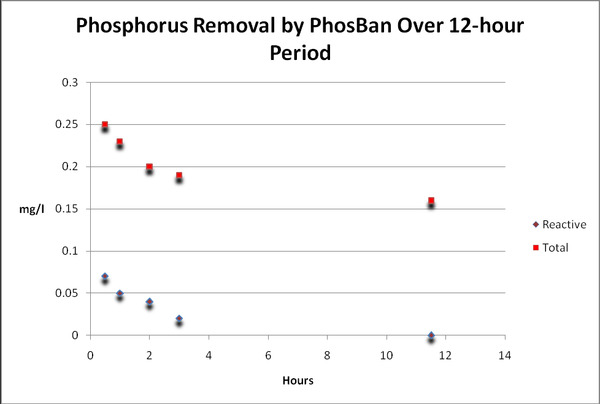 Time-course Reactive (ortho-) and Total Phosphorus removal by PhosBan. See Discussion section (below) for comments. Figure 2. Total Phosphorus remained about the same during the experiment which is not surprising, as much of this element is probably found in suspended particles (algal cells, bacteria, food scraps) and not readily available to promote algae growths. TLF also claims that silica is removed by PhosBan as well. 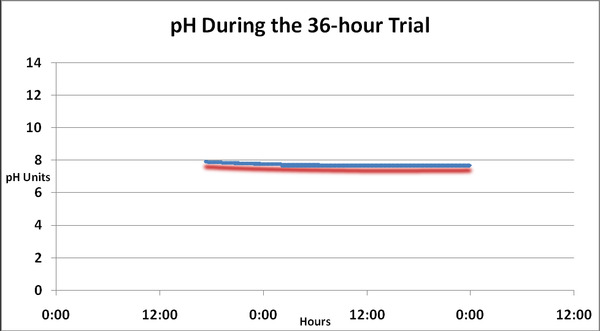 Figure 3 shows the results of testing 3 samples gathered over a 21-hour period after initiating treatment with PhosBan. Figure 3. 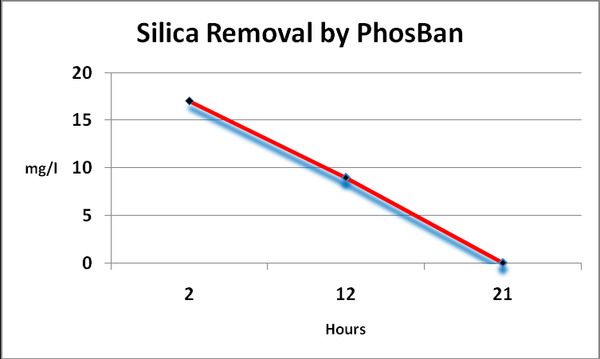 PhosBan quickly removes silica. A Hach HQ40d data logger equipped with a calibrated pH probe recorded pH values every five minutes over the course of 36 hours. pH fell slightly, but some of this drop is attributable to rising temperature (temp data not shown, and due to powerheads’ operation within the aquarium). See Figure 4 and the Discussion section below for further comments. 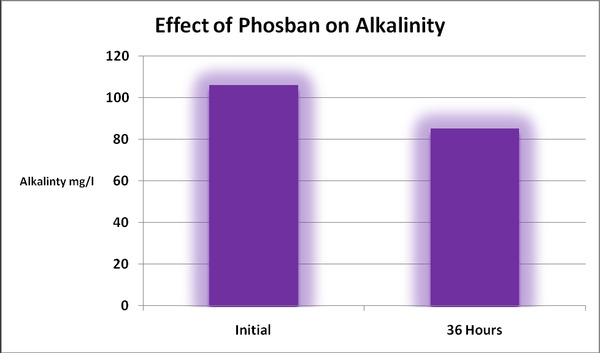 The effects of PhosBan on alkalinity would be a better metric of its impact. See below. Figure 4. pH of treated water fell over the course of 36 hours, but see comments in the Discussion section below. Directions for use of the PhosBan Reactor state that alkalinity will drop when 5x the recommended amount of PhosBan is used. Under the conditions of this experiment, alkalinity dropped by about 19% when PhosBan was applied at about twice the recommended amount. See Figure 5. At face value, this may seem negative until we consider that the presence of both phosphorus and silica lend to alkalinity (Standard Methods, 1998). Therefore, a portion of alkalinity drop could be attributable to their removal, and results generated by alkalinity testing in this situation could be partially attributed to removal of ‘false’ alkalinity and not a drop in carbonate content. Figure 5. Alkalinity was negatively impacted when PhosBan was used at about twice the recommended amount (100 grams for 182 liters – 48 gallons) – but this is not necessarily a bad thing! Note that alkalinity was marginal to begin with. See text for details. Color of water can be estimated using a comparator or a colorimeter/spectrometer. Color is due to dissolved organic substances (called gelbstoff, German for ‘yellow matter’) in the water column. Generally, color due to these substances is yellowish and is reported in Platinum/Cobalt units. A few milligrams of dry PhosBan was placed in a beaker containing 100ml deionized water and allowed to sit overnight. A sample was analyzed for color (at 455nm). PhosBan did not impart color to the water. On the other hand, GFO has the potential to remove organic substances causing yellow water. This was not tested. The PhosBan Reactor 150 is constructed entirely of plastic and acrylic materials and is safe for use in freshwater and saltwater applications. The clear acrylic material of the reactor itself appears to be about 1/16″ (~1.6mm) thick and is rugged enough to withstand some abuse. The 90°elbows fitting the barbed fittings atop the reactor are made of a soft rubber-like material and are friction fits. Use cable ties to affix these 90’s to the reactor if desired – avoid stainless steel worm clamps that might compress and break the barbs. This reactor holds about 36 fluid ounces (1,075ml) and has a useable capacity of about 26.5 fluid ounces (~785 milliliters). Assuming PhosBan has a consistent density, the 150 reactor will hold approximately 7.3 ounces (207 grams) of this material. Using the manufacturer’s recommendations for loading, the reactor will hold enough PhosBan to treat a maximum marine aquarium size of 200 gallons (757 liters; using 50 grams for 50 liters). It should be sufficient to treat a 400-gallon (~1,500 liter) freshwater aquarium. Note that these ratings are higher than TLF’s recommendation of a maximum aquarium size of 150 gallons. Under the conditions of these tests, TLF’s 150 Reactor containing PhosBan quickly removed both phosphates and silica to levels below the detection limits of the spectrometers (for our purposes, the concentration of both silica and ortho-phosphate fell to ‘zero’). GFO can potentially remove other chemicals including cobalt, manganese, zinc and nickel (Holmes-Farley, 2008). All (save the latter) are important micronutrients for algal growth. The effectiveness and rapidity of GFO in sequestering these is unknown to me. TLF’s 150 Reactor and PhosBan media performed as advertised. Under the conditions of this testing, both phosphate and silica concentrations fell to levels below the detection limits of ‘laboratory grade’ instruments. There is some concern about depleting reactive phosphate levels too quickly and/or for extended periods of time (remember Liebig’s Law of the Minimum discussed earlier). Proceed slowly with the application of any product in a reef aquarium and closely watch corals for negative reactions. While reactive phosphate is effectively removed, the same cannot be said about the form of phosphorus (acid hydrolysable) that requires vigorous laboratory digestion processes before analysis. Information suggests that almost all of the acid-hydrolysable phosphorus is suspended – not dissolved – in the water column and this form should not be of much concern to hobbyists. The media reactor is well made and should provide years of service. The adsorption material is relatively dust-free (although it should be flushed with water per the manufacturer’s recommendations) and has not crumbled and added any apparent particulates or color to the aquarium water. In addition, there were apparently no significant negative impacts on water chemistry even when used at twice the recommended amount (however I would strongly advise hobbyists to follow the manufacturer’s directives). The successful application of these products in aquaria around the world is a testament to their functions. If you’re battling algae outbreaks and need a quick solution, give these products a try. A 55-gallon (208 liters) was filled with 48 gallons (182 liters) of well-aged artificial seawater from a fish-only aquarium. A PhosBan Reactor 150 was installed according to manufacturer’s recommendations. Since the suggested amount of PhosBan for 48 gallons of seawater did fill the reactor to the minimum recommended level, the dosage was doubled to 100 grams of PhosBan phosphorus adsorbent to fill the reactor to the recommended depth of 2 inches (~50mm). A Maxi-Jet 400 provided flow, which was regulated to 19.6 gallons per hour (~1,240 milliliters per minute) using the supplied in-line ball. Baseline water samples from the aquarium were gathered in PO4-3-free bottles, and again at 0.5, 1, 2, 3, 11.5, 21, and 36 hours after starting the reactor’s pump. These were analyzed for Total Phosphorus and Reactive Phosphorus using a Hach 2800 Spectrometer, DRB 200 Dry Thermostat Reactor, and reagents from Hach (potassium persulfate and sulfuric acid for digestion, and ascorbic acid method for analyses). Hach advertises the range of the ortho-phosphate analysis to be 0.02-2.50 ppm and total phosphate as 0.06-3.50 ppm (both expressed as PO4-3). Alkalinity (as calcium carbonate; CaCO3;) was determined using a Hach Digital Titrator and alkalinity reagents, using a calibrated pH meter and probe to determine titration endpoints (which varied from 4.5 to 4.8, depending upon phosphate concentrations and the presence or absence of silica) . A Hach HQ40d data logger equipped with a pH probe measured and recorded pH and water temperature every 5 minutes. Silica was determined by a LaMotte Smart2 colorimeter using LaMotte silica reagents (high range – 0-75 ppm, using ammonium molybdate in an acidic state, with oxalic acid added to prevent a reaction with phosphate and molybdate). Holmes-Farley, R., 2008. Reef Alchemy: Iron oxide hydroxide (GFO) phosphate binders. Reef Keeping Magazine Online.